Lately I’ve been reading about what makes environments restorative — those secret spots we go to feel whole, or grounded, or to be reminded of who we really are and what it’s really all about. What is it about those places? And are they only places? Or are they also the things we do when we’re in them? There’s a good bit of literature out there already and I’m only scratching the surface of it at this point. However, I’ve scratched down enough to articulate some distinctions between the ideas people have and so I thought I’d write them up in an effort to share what I’m learning and also to watch how my understanding of these concepts evolves over time. Attention Restoration Theory (ART) is an idea by Rachel and Stephen Kaplan, and I’ve blogged about it before. In ART, your attention is depleted by the demands of an environment and to restore it, you must get into an environment that has certain very specific features or conditions. It must feel like you’re 1) getting away, 2) that where you’re going is explorable and structured enough without feeling overwhelming or unsafe, 3) that what you want to do while you’re there is socially and physically possible, and 4) that it holds your attention without depleting it. This last quality, called fascination, is the magic of ART. It’s where the restoring bit happens. Stress Recovery Theory (SRT) is an idea by Roger Ulrich. In SRT, one experiences stress and seeks out a restorative environment to recover. Nature, in particular water and vegetation, are especially restorative because from an evolutionary perspective, we perceive them as a resource rich (we will be more likely to survive near water and vegetation so it calms us). SRT is highly dependent on visual perception, and is a theory that relies on emotion: when we enter an environment, our bodies (and hearts) respond first, then our brains. We may cycle through memories and think about a space once we’ve had that initial emotional response, but the emotions are primary, and if we feel preference or aversion, those instincts will lead our way. In SRT, certain qualities of an environment are likely to cause us to calm down. The aforementioned water and vegetation are two (he calls these “natural features”), but there are others such as complexity, structure, depth and ground surfaces. These words have special meanings that I may blog about later, but essentially they all result in the perception that an environment is non-threatening, lacks tension, and is interesting. And last, there’s Information Processing Fluency Theory (IPFT — sounds like a Myers Briggs score). This is a theory by, as best I can tell, Yannick Joye. I’m just digging into it and it’s far less cited or popular (and far newer) than the other theories, but here’s what I perceive the idea to be. Joye thinks we are not restored by nature, per-say, but by environments that are easy to process. This agrees and disagrees with parts of ART and SRT. For example, both theories suggest this concept in their own ways (“fascination” in ART is close, so is “complexity” in SRT), but neither theory relies on it the way IPFT does. Joye thinks nature’s restorative because it’s easy to process and he thinks it is easy to process because there is much “self-similarity” thanks to how fractal-based nature is. (I’ve got to admit that’s kind of clever.) What this does for restorative environments is that it opens up what’s eligible. Now, we can look at built environments as naturally restorative if we are (for a whole hosts of reasons, I’d imagine) highly fluent in processing the information within them. So there. That’s what I’ve got today. I’ve a ton of reading and thinking still to do about all this, but how very interesting it is to explore these ideas and see how they respond to 1) contemplative space (as opposed to restorative space) and 2) pervasive and persuasive technologies that abound in nearly every space we go. More! Soon! Kaplan, S. (1995). 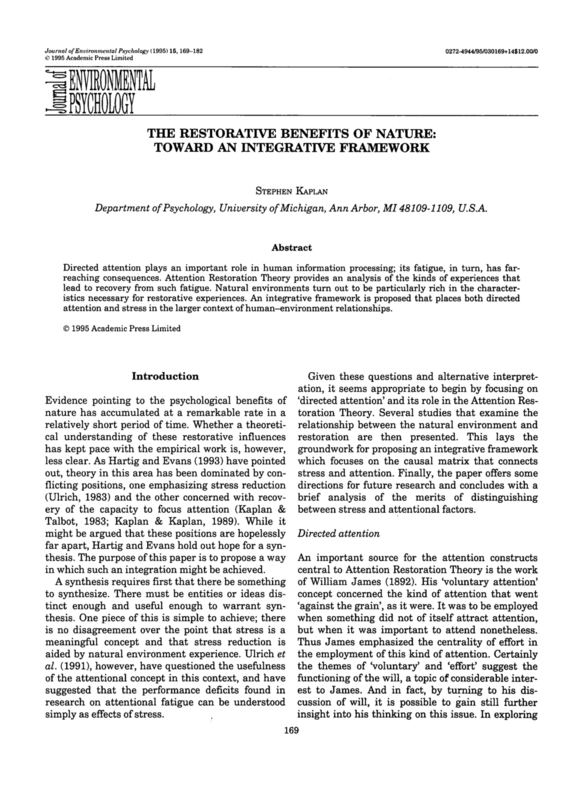 The restorative benefits of nature: Toward an integrative framework. Journal of Environmental Psychology, 15(3), 169–182. Ulrich, R. S. (1983). Aesthetic and Affective Response to Natural Environment. In I. Altman & J. F. Wohlwill (Eds. ), Behavior and the Natural Environment (pp. 85–125). Boston, MA: Springer US. Joye, Y., & van den Berg, A. (2011). Is love for green in our genes? A critical analysis of evolutionary assumptions in restorative environments research. Urban Forestry & Urban Greening, 10(4), 261–268. To create a map of restorative space on UW's campus, I’ve been researching what makes space restorative and I've come across the following framework from the Rachel and Stephen Kaplan. Big caveat before reading: Work in progress alert. I am constantly learning and reshaping my understanding of these concepts. Rachel Kaplan is a professor emeritus at the University of Michigan. Stephen Kaplan, also a professor emeritus at UM, passed away this summer. Together and individually, they’ve authored many seminal works exploring how and why access to nature matters to human health and well-being. So, what exactly is getting restored by a restorative environment? According to the Kaplans, it’s attention. They argue that attention is a limited, deplete-able resource and certain environments, nature being the best example, can fill that depleted attention reservoir right back up (they call this attention restoration theory). In order for an environment to restore one’s attention, it must have the following four qualities at once: being away, fascination, extent, and compatibility. The first quality is that the environment gives a sense of being away. For an environment to be restorative, it must feel like you have escaped or withdrawn from your ordinary (attention depleting) environment. The second quality is that the place you escape to must be interesting, it must have fascination. Fascination is tricky because there are fascinating things that are not restorative, for example a train wreck or some trollish Twitter thread. Fascination in the Kaplan’s sense is a magical (that’s my word) quality of an environment where your attention is held but not drained. To better approximate this non-draining quality of fascination, some use the phrase soft fascination (like a walk in nature) as distinct from hard fascination (like a riveting television show). In addition to being away in a fascinating space, the third quality a restorative environment must have is extent. That is to say it must feel like “another world” entirely from the one you’re escaping. To have extent, this “other world” must be explorable without being overwhelming. Places with extent strike a good balance between 1) having lots to explore, and 2) giving you the freedom to do so, while 3) also having enough structure so you feel safe, without 4) feeling like they’re full of restrictions and rules. It should be noted that the extent doesn’t have to involve physical space, it can be an internal experience, too. And then on top of everything, the fourth quality a restorative environment must have is compatibility. There must be a rightness to how you want to use the space and what the space is for. If you found a spot that met the other requirements (it was away from it all, had soft fascination, and plenty you were eager and safe to explore), but wasn't made for that purpose or didn't accept your presence there, it wouldn't be restorative. Indeed, it might be quite stressful or frustrating. To be restorative, the space has to work for you and you have to work for the space.